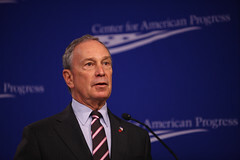 New York City Mayor Michael Bloomberg made a strong stand against the United Federation of Teachers (UFT) in his State of the City address on Thursday. With the city standing to lose up to $60 million in education grants due to the UFT’s resistance to teacher evaluations, Bloomberg wants to bypass the union with a bold plan. Reforming the evaluation system has been a top priority for many districts since it is one of several prerequisites to receive federally sponsored Race to the Top funds. The union had agreed to work towards a new evaluation system, but UFT President Michael Mulgrew refused to give principals full authority to remove ineffective teachers and stalled existing disciplinary cases by failing to select arbitrators. Rather than working with the union to develop a new evaluation system, which could possibly help replace 10 percent of teachers, the city will create school-based committees to evaluate teachers on merit and replace up to 50 percent of the current faculty if necessary. Under the new evaluation system teachers with a “highly effective” rating for two years in a row would receive a $20,000 raise per year. Not only would the new system help retain current exemplary teachers, but also in order to attract more high-quality teachers the city would pay up to $25,000 off student loans for college graduates who finish in the top quartile of their class to become teachers in New York. In addition to evaluation reforms, Bloomberg also wants to close down ineffective schools and open 100 new schools, 50 of which would be charter schools, within two years. Twelve new career and technical schools would also open with extra money from private sources given to schools that have shown success graduating minority men. Mayor Bloomberg appears to have an ally in Governor Cuomo, who also took a hard line against the teachers union in his State of the State address. Evaluation reform is one of the best ways to get rid of bad teachers, which with union interference is otherwise often impossible. It is incredibly encouraging to see Bloomberg and Cuomo take such a bold step towards desperately needed education reforms and away from malignant teachers unions.